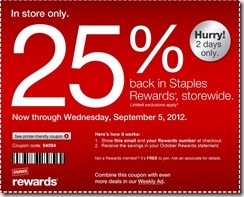 Through September 5, 2012, Staples is offering 25% back in Staples Rewards. Valid in-store only. *Valid through 9/5/12 in Staples® U.S. stores only. No limits per day or per member. Offer valid only for original recipient of this email as sent by Staples. Standard Rewards will be excluded from items receiving promotional Rewards. Maximum of one Rewards promotion will be given for each item purchased. Price eligible for Rewards is the amount paid at checkout after application of all promotions, coupons, instant savings, and Rewards redemptions and does not include tax. Not valid on desktop or laptop computers, tablets, netbooks, Beats Audio™, Soul by Ludacris, Amazon Kindle®, NOOK®, Epson® ink and toner, custom printing orders placed online, gift cards, cell phones and cell phone services, Staples® EasyTech(sm) professional-grade and on-site services, depot repair and parts, phone cards and postage stamps. Must be a member of Staples Rewards®. Staples Rewards membership is FREE. Rewards expire no less than 60 days after issuance. Limit one Staples Rewards account per person or at any mailing address. For full program details, visit staplesrewards.com.